Welcome the beginning of summer at an art-filled party. 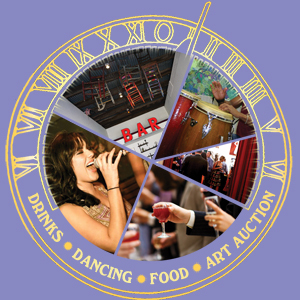 Enjoy tasty treats, libations, dancing and an “Artrageous” auction! Saturday, June 21, 7-10 p.m.
NEW! Check out our delicious Summer Solstice menu, specially prepared by “An Affair to Remember” Catering! An “Artrageous” auction will include art, entertainment and dining packages including a delicious Italian meal prepared at your home by Il Davide Chef David Haydon! Thank You, Everything Under the Sun sponsors! Please support businesses that support arts education for children in our community. For information on becoming a sponsor, plus our online sponsorship form, please click here.